View from Tour Montparnasse. Visible at a distance behind the Eiffel Tower is the Bois de Boulogne and La Défense. Paris. I made five trips to Paris during my adult life without going to the top of the Eiffel Tower. Admittedly, I was conflicted. In foreign travel, my husband, Ken, and I pride ourselves on living like locals. Spending a lot of money for the right to brag that we checked off this bucket list item seemed totally hypocritical. Like many native New Yorkers, I’ve never been to the top of the Empire State Building, either. That’s for tourists, was my usual rationale. So it seemed to follow, according to my somewhat twisted reasoning, that there was no compelling reason to go up the Eiffel Tower. Each time I was tempted, circumstances provided a ready excuse. In anticipation of a July visit one year, and another time, in early September, we tried too late to buy advance tickets, and didn’t want to brave the long lines in person. Finding ourselves here during the 2015 terrorist attacks, we strolled by the tower a couple of days later thinking this would be a moment to beat the crowds, and found it closed, reportedly due to staff concerns about their safety. And last year we had such a classic Parisian view from the living room of our Airbnb rental, that we were satiated. It captured the iconic architectural elements of the city, as it was rebuilt in the late 19th century, under the stewardship of Georges-Eugène Haussmann, Emperor Napoléon III’s head of public works. There was the broad, tree-lined Boulevard Henri IV leading to Place de la Bastille; limestone apartment buildings with ornate wrought-iron balconies; and networks of old clay chimneys. Here, on the edge of the Marais neighborhood, we could also spot the dome of St.-Paul-St.-Louis – a 17th-century Jesuit church. This year we had no such luck. The Airbnb listing for our flat, in the Denfert-Rochereau neighborhood, promised a “great view,” which was surely a reference to the Panthéon in the distance. But it was overpowered by a close-up of scaffolding across the street and a building shrouded in tarp. This got us off to an unpleasant start with the owner, who had assured me when we booked last February that there was no construction in the area, and who thought she had no obligation to update us as circumstances changed. 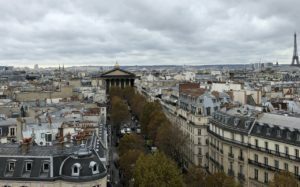 While we made the most of the situation (and sought recompense through Airbnb’s complaint system), we looked for other ways to enjoy Paris from the rooftops. A logical starting point, though it wasn’t our first stop, is the Tour Montparnasse (33 Avenue du Maine, nearest Métro stop Montparnasse Bienvenue). A hideous skyscraper in a city of mostly low-rises, it has the benefit of offering a 360-degree panoramic view of Paris. One can enjoy it either from the 59th-floor outdoor deck, or inside on the 56th floor, where there is a snack bar and souvenir shop. The elevator ride up costs €18 per person, or about $20.50 at current conversion rates. Though there wasn’t a line to purchase tickets on the day we visited, during the busy summer tourist season, it would be advisable to buy advance tickets online. Entrance isn’t timed, and you can use the tickets within a year of buying them. If you want to brush up on Paris geography before going, I recommend Streetwise Paris – a laminated map that I take on every trip. Maps posted strategically on the deck at Tour Montparnasse can help you identify any monuments you don’t recognize. I have to admit that the place delivered. The most striking vista is the top-to-bottom look at the Eiffel Tower. Visible at a distance behind it is the Bois de Boulogne, a former royal hunting ground redesigned as a park during the Haussmann era, and La Défense – the skyscraper office development on the western edge of the city. What’s lost from this vantage point is the Seine river, which defines the city, dividing it into left and right banks, and the sense that the great Cathedral of Notre Dame is situated on an island in the middle of it. Since the river is depressed, it’s not visible from Tour Montparnasse. And because this building is in southwest Paris, far from the city’s most famous landmarks (for example, Notre Dame is 4 kilometers, or 2.8 miles, away), the view lacks immediacy. No tickets are necessary to appreciate the view from the terrace of a Printemps department store. Surprisingly, we had a much more intimate experience at Perruche Restaurant, on the ninth floor of a Printemps department store (2 rue du Havre, nearest Métro stop Havre – Caumartin). There’s no charge to take the elevator to the terrace, and survey famous buildings nearby, including the opulent opera house with its Baroque adornments; La Madeleine church; and Les Invalides, where Napoléon is entombed. Beyond it, the dome of Sacré-Coeur rises like a hulk on one of the city’s highest points. For those who want to linger over a drink, Perruche has a large outdoor terrace, which was closed the day we visited because it was too cold and windy. Instead, we requested a table inside, where we could enjoy a mid-afternoon coffee and rendezvous with an old friend. Having made our intentions clear, we were kindly seated at the best table in the house – in the corner, with a view of the Eiffel Tower. The total tab for non-alcoholic beverages for the three of us came to €18.50, or about $21. No one rushed us as we sat there for more than two hours chatting. Meanwhile, the reflection of the setting sun on the Eiffel Tower made it look as if it was gilded in copper. And yes, this trip we finally made it to the top of that tower. Inspiration struck as we sat in the sculpture garden of the Musée Rodin, from which one can see the Eiffel Tower and Les Invalides. It was a beautiful autumn day, ensuring a perfect view. Using an iPhone, we booked tickets for two hours later at €25, or about $28 apiece. Still, we stood in line for about half an hour and were herded like cattle through two elevator rides to get to the top. The ascent was breathtaking, but without a native in site. At the top, we witnessed other travelers, toasting with bubbly from the Champagne bar, and calling relatives back home to share the moment. Here in selfie central, we could no longer kid ourselves: We were officially tourists. View of the Seine from the Eiffel Tower. As all of Paris spread out before us, the view of the Seine was most captivating. 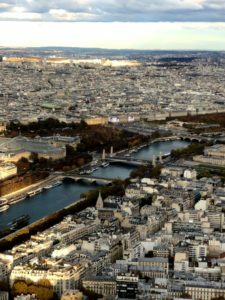 There were the bridges connecting the two banks, and the Paris monuments that we had visited, including the Arc de Triomphe, the Louvre Museum and Notre Dame. The only thing missing, of course, was the most famous symbol of Paris: the Eiffel Tower, in which I was standing. On that score, we came full circle several days later, while riding the Métro. We had visited Parc Monceau and Musée Nissim de Camondo – a decorative arts museum housed in an elegant mansion – and were on the Number 6 train heading back to our apartment at about 5:30 in the evening. Crowded with commuters during the Parisian rush hour, the train was traveling above ground, when we looked out the window and saw the Seine beneath us. 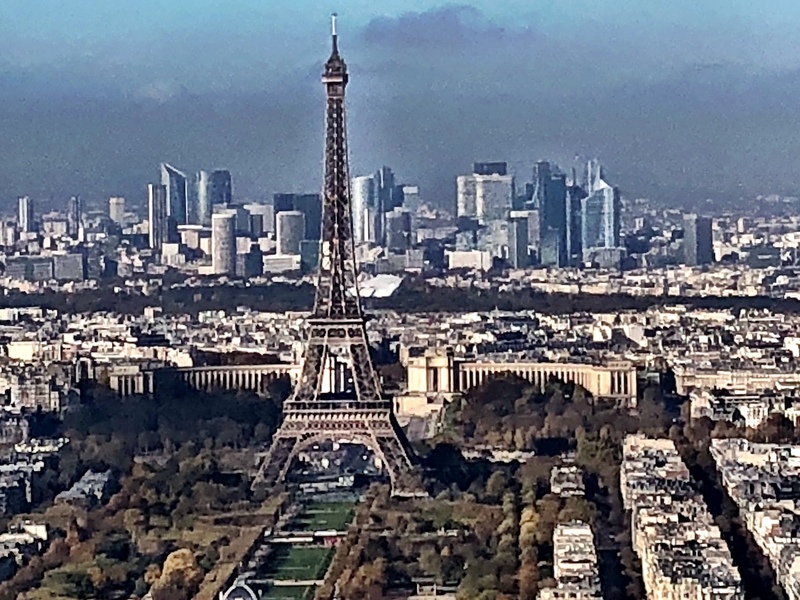 Then, suddenly, between the stop for Passy and Bir-Hakeim, the Eiffel Tower loomed large in plain view – again, copper-colored in the autumn sun. Commuters scanning their iPhones were indifferent to it, just as I don’t look twice at the Statue of Liberty, visible from the F subway train that I take all the time in New York. It was an experience that anyone could replicate for the price of a Métro ticket: Heading in the direction of Charles de Gaulle-Étoile, on Line 6, face forward and sit on the right. On the return trip, toward Nation, sit on the left. It’s a spectacular – and cheap – Parisian thrill. Deborah L. Jacobs is the author most recently of the five-time award winning book, Four Seasons in a Day: Travel, Transitions and Letting Go of the Place We Call Home, about her adventures – and misadventures – living in France. Follow her on Twitter at @djworking and join her on Facebook here. You can subscribe to future blog posts by using the sign-up box on her website’s homepage. Ride Bus 72 along the Seine (rive droit) from the Western end of Paris (St. Cloud) to Hôtel de Ville – sit on the right (river) side of the bus if you can – when you need to drink in the city, rest a bit, and do not want anything to drink. Thanks for the suggestion. Will do!